EURIE Summit repeated its success this year by hosting 2.500 attendees from 60 countries with a great variety. On 27 February-1 March, 2019, 150 Exhibitors took place with their booths where there were the highest level of representative of higher education institutions, consortiums, international service providers, general consulates and other public / official institutions and organizations. It has been an honor to host every each attendee who had contributive participation at EURIE 2019 in Istanbul at Lutfi Kirdar Congress Center on 27 February-1 March, 2019. The total number of the attendees came out as 2.500 at EURIE 2019 this year where they were from 60 different countries of Eurasian region as well as the rest of the world including North and Latin America, Asia, Middle East and Africa with considerable number of attendees. +150 exhibitors took place at EURIE Summit which carried out a great sphere in the middle of the venue at the Expo Hall. Furthermore 53 sessions covering panels and individual presentations were held with 124 speakers throughout 3 fulfilling days. Thereof we would like appreciate 19 Collaborative Partners who supported EURIE 2019 – Eurasia Higher Education Summit and enabled the above mentioned quantity and quality to come out. Turkish Gala Dinner was joyfully held on 27th of February, 2019 on the first day of EURIE 2019. Due to completion of first day, the attendees who were registered online through EURIE Mobile app for EURIE Gala Dinner were picked up from the congress center to the famous Feriye Palace at the charming Bosphorus of Istanbul. 53 sessions of panels and individual presentations were successfully held at EURIE 2019 on 27 February-1 March, 2019 throughout 3 fulfilling days. Internationalization of higher education, new trends in higher education, innovation, country panels and plenty of other aspects were properly reviewed by the highly prestigious speakers and panelists from all across the world. For those, who missed some of the sections or could not have the chance to attend EURIE Summit this year, the records of the panels and presentation are uploaded on EURIE website. Keep an eye on it to download any sessions you’d like in PDF format. .
Due to completion of EURIE 2019 successfully and returns of attendees to home, the special EURIE 2019 Appreciation Letters and certificates of participation were started to be sent to attendees personally. As all we hope was to meet your valuable expectation, we are proud to receive responses and feedbacks from the attendees congratulating us for the entire organization and hospitality for which we tried our hardest. EURIE 2019, the 3rd largest higher education event in the world, was led by the attendance of EURAS member institutions and partner organizations. Nearly 50 members and partners in total from various parts of Eurasia took place at EURIE 2019 as visitors and exhibitors to benefit all the section within EURIE 2019 as well as to participate EURAS Annual Meeting. Some of our member universities of EURAS - Eurasian Universities Union that participated in EURIE 2019 were University of Trieste and Roma Sapienza University from Italy, Nakhchivan State and Nakhcivan Universities from Azerbaijan, Middlesex University from UK, Cyprus Science University from TRNC, Superior University from Pakistan, University of Tehran, Amirkabir University of Technology, Shandiz Insitute of Higher Education, Tarbiat Modares University from Iran and K. Zhubanov Aktobe Regional State University from Kazakhstan, Management & Science University (MSU) from Malaysia greatly took place at EURIE 2019 - Eurasia Higher Education Summit. Furthermore EUMex-Connect, as the brand new partner institution of EURAS as well as AARU, UNIMED and IAUP participated EURIE Summit with their incredible contributions. Once again we would like state our appreciations to all of them for actively being part of EURAS Network. EURAS Annual Meeting was successfully held on the 2nd day of EURIE 2019 where all the member and partner institutions were represented. The opening speeches were occurred by EURAS President, Dr. Mustafa Aydin and afterwards Mr. Anass Bennani, Director of Cooperation and Partnership in Ministry of National Education, Vocational Training, Higher Education and Scientific Research of Kingdom of Morocco on behalf of H.E. the Minister Saaid Amzazi. 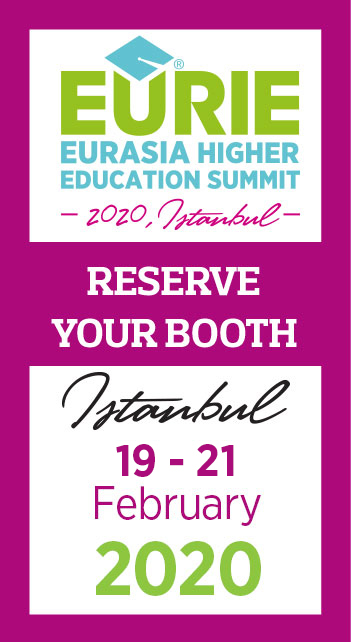 Study in Turkey, Study in Kazakhstan, Study in Mexico, Study in China, Study in Malaysia, Study in Russia, Study in UK, Study in Iran and many others with the top universities participated EURIE 2019 – Eurasia Higher Education Summit where the great opportunities came out thanks to the number and variety of country pavilions. 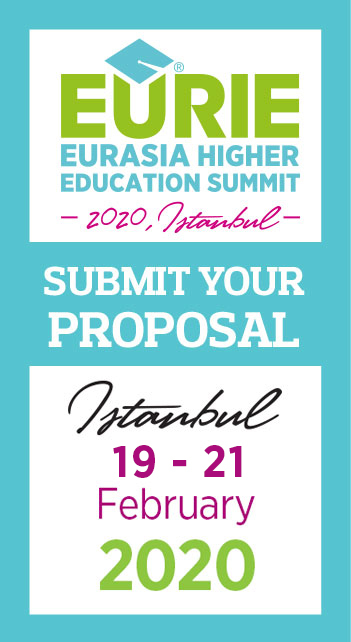 EURIE Flickr is waiting for you to take a look at the fruitful moments of EURIE 2019 – Eurasia Higher Education Summit held in Istanbul on 27 February-1 March, 2019. If you would like to see pictures where you were captured or to see the Summit you missed to attend this year, all you need to is one click further on EURIE Flickr.